Here is illustration 38 in the series! I think it’s interesting to see how this style has evolved over the last couple years. 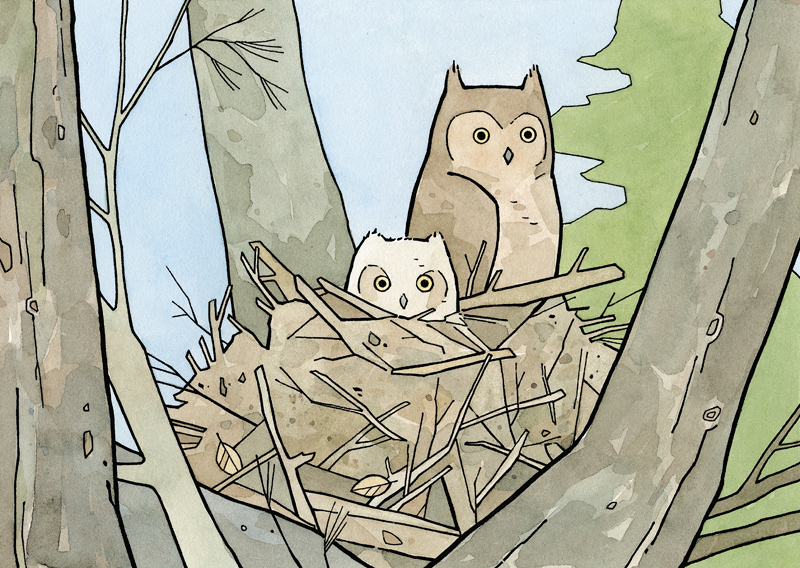 As this has turned into a long-term side project, you can especially see it in the owls. Drawing owls comes a lot easier now. In my recent ones I am tending to put in a bit more detail to distinguish the different species. Anyhow, here is a Great Horned Owl and a fuzzy owlet peeking over the edge of a nest. Owls don’t build their own nest, so they sometimes uses the old nest of a squirrel or hawk. When I drew this I liked to think they might have stolen this one from an Osprey.